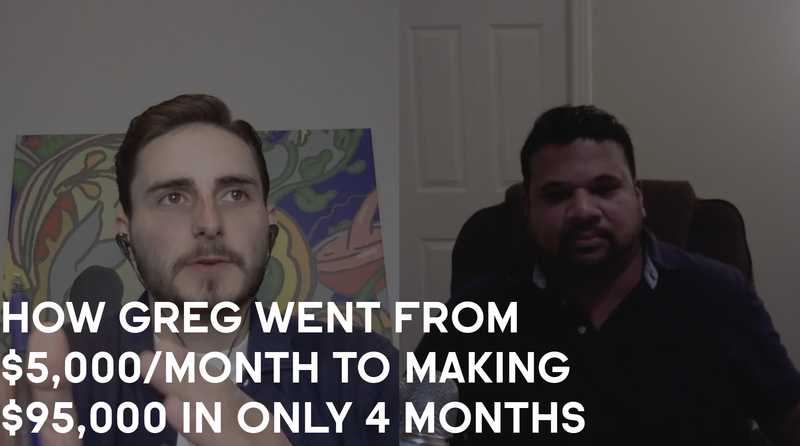 How Greg Went From $5,000/Month To Making $95,000 In Just 4 Months. Niche: Helping network marketers grow their businesses online. 1. Where Greg was before joining Consulting Accelerator. 2. How Greg picked the wrong niche first, overcame the setback and pivoted. 3. Why even with years of niche experience, he still did market research. 4. The process Greg used to land his first few clients. 5. How Greg packages his services and delivers. 6. The importance Greg stresses on story-telling and pull-based marketing. 7. The most transformative part of the program for Greg. Nick Hauser:	Welcome everybody, Nick Hauser here in today's interview, I'm gonna be sitting down with Greg Vegas and Greg joined consulting accelerator back in July of 2018 and at that point he was making five k per month and it just about four months he's made, you know, a little under $100,000, which is pretty awesome. Ninety 5,000 to be exact. And what Greg does is he helps network marketers grow their businesses online. So we're gonna jump into Greg Story and how he made such a large transformation in a short period of time and you know, figure out, you know, what's the secret sauce is here for you. So Greg, what's going on today? Greg Viegas:	just excited man, I'm, you know, I haven't been excited about something in a while. So really, really blessed to have found the, the, all these programs that are going on with your guys and Sam Ovens. Nick Hauser:	Perfect. Before the program got started, you know, what was life like? Where are you doing? Greg Viegas:	So I was with part of a, I was a network marketing and I mean I started there, uh, 20 years ago, but I was an internet marketing before that and you know, it was doing about 30 grand a month was doing really, really, you know, really comfortable there and the company went out of business and a lot of my friends and myself were there. Uh, we kind of started a struggle. We went for earning such an, you know, a comfortable amount of income to pretty much almost like nothing where we've got nothing leftover. And then what am I really good friends, Chris Record was talking about Sam Ovens and whatever, you know, Chris and I are, you know, we knew each other over the years. We had success and accompany. So based on what I saw Chris do and I was like, I got to get this program and I just jumped in. Man, you know, being an entrepreneur you don't go, you don't go a little bit, you go, you go 100 miles an hour with whatever you do. Nick Hauser:	Nice. So you joined there and at that point with that other kind of business, a flattened and the income dropped, were you doing anything on your own at that point or were you kind of looking for an opportunity? Greg Viegas:	I was trying to do Econ, you know, I was trying to do Amazon, I was trying to shopify, I was spending tons of money trying to figure out what to do there and I just kind of figured out. I mean I'd see all these people doing crazy crazy numbers like on shopify and posting all their results on facebook. So what do I do? I look for resources, right? I look for people that are creating courses. Well, I bought the best courses. I, I sought out the best people and I still couldn't get it to grow. So it was kind of kind of just treading water and until I found this program. Nick Hauser:	Awesome. So you could join accelerator July 2018. First thing we get you to do with the program is, you know, pick your niche, who the group of people you want to work with. What was that process like for you when you're getting started? Greg Viegas:	So it was very interesting for me because I picked a niche that wasn't this niche and that niche was, it was helping people in real estate and uh, and it kind of went through that. And then as I went through the program, I kind of evolved and I was speaking to a very close friend who's also an entrepreneur and he's like, dude, what do you do doing that's not in your niche? You know, nothing about that. And then, you know, we were talking and then Bam, we were, I was going through consulting accelerator. I can't remember what week it was, it wasn't even the niche week. It was something else. And it just hit me. It's like this is my niche. That was not my niche. And it's so funny. As soon as I made that small little transition, I mean, it just like I was literally closing sales like right away. Nick Hauser:	That's a great point about the quickness of the momentum once you really believe in it, a lot of members get stuck right there. Can you explain a little why you chose real estate when getting started? Greg Viegas:	I don't know, it just, it just seemed like, you know, you, you just start to think quickly and you start to say what would work and stuff like that. And I was living in California and I'm like, hey, they probably need help and you know, you talked to a few of them and, and, and most people see what I find is most people when you, when you talk to them about, you know, for example, if it's facebook ads or something, all the, and I talked to a couple of realtors, all they talk about is boosting posts. That's all they know, right? And, and of course that doesn't work. So based on those conversations, I thought that was the niche, but I kind of knew it wasn't until I had that breakthrough. Thank God I had that breakthrough and change my niche. Nick Hauser:	And you said your friend mentioned it to you, like you know, that's not your niche. Looking back on a two and maybe some of the feelings you had associated with, maybe this isn't my niche. How did you really know now looking back, that real estate was definitely not your niche, so others can be like if they're in a position similar, right? Like maybe I should make a pivot here. Greg Viegas:	So basically I'm on the inside looking out and my friend was on the outside looking in. Right? So he can see stuff that of course I can see. And you know, sometimes it helps to talk to other people that know you really well that are in business. Okay. I'm not not like your, your relative or something like that, that there's nothing about what you do. Right. But maybe someone that you've gone to events with, someone that you worked with, someone that knows you know what your personality is. I mean being in network marketing since I was 18, reading all the books, going to seminars know, speaking on stage at different events and stuff like that. My friend liked the way he told me on the phone and was like, dude, you're crazy. What's wrong with you, your niches? Mlm, Nick Hauser:	that's awesome. So what happened next? Then you had that breakthrough. You're going through one of the weeks in the training, they say, you know what, this, this is kind of been in right in front of me. Almost the whole point, given your experience, like what was the next thing you did to go and certain landing those cells. Greg Viegas:	So the next thing I did was I'm like, I got to find proof of concept, which is what Sam talks about in this course. So I started doing that and then Bam, I got one and then I got sick and then I got to like a six figure one and then it just continuously continuously grew. Uh, because what I found is when you, when you, when you, when you find a niche, research that market. So I researched the market, I started looking for people in that industry is sort of calling them and I found they knew nothing. Like literally, like I just recently went to one of their, um, you know, an event for them. And it's very interesting that they are training on stuff that we were taught probably five or six years ago. Nick Hauser:	I think it's a great point you bring up that you had experience in this industry, right? You still went back and did research to catch up on things. It was really interesting too. I was listening to a podcast about the founder of Lulu Lemon is like worth over a billion dollars, another company plus, but he had been in a similar space, but when he went to found that company, he still went back and talked to the market. Like it's always refreshing to hear somebody say that because a lot of people in our programs and stuff, when they're struggling it's because they're not doing that. Right. So after you did that, you know, how are you actually reaching out to these people to, you know, research and understand more about the challenges they were facing. Greg Viegas:	So what I would do is take maybe, you know, an internet marketing. We always test by metrics, right? You know, when Sam talks about facebook ads, he talks about metrics and stuff like that. So I know if I task, if I, if I talk like 10 people or 15, 20 people that I can, I can make a judgment on that. So I started conversations with facebook conversation, right? What's easy to do is easy not to do, you know, one of my mentors, Jim Rohn taught me that a long time ago. So I'm like, I'm going to do this. I'm gonna, I'm gonna start some conversations. So I did that and I found that zero, like literally zero of them knew that they use a platform like facebook and facebook ads to, to build, uh, you know, to build a business. You know, it's so funny. One of them was like, what's a pixel? I've heard of that. Is that a picture? And I'm like, Nick Hauser:	I really like the pixels Todo. Well, there you have it. Then you knew. Did you have any background in facebook ads like that you knew that, you know, facebook would be the thing to help them or you kind of like, it sounds like I can help them with something here, but I still have to figure it out on my end. Greg Viegas:	So, you know, going back to my old friend Chris Record, um, you know, we will always use it, dabbled in facebook ads and learn that stuff. So, you know, using facebook ads was a tool that I always knew that could be used and in of course it just evolved and it became better and better, you know, along, along the road there. So I knew a little bit but I did not know the stuff that is taught in the program, like that stuff blew me away. Nick Hauser:	Nice. And so you understand their problems now that the more current problems and then you figured out how you're going to service them. What did you do? Index to go out to reach out to people and Atlanta first few clients. Greg Viegas:	So all I did. So the same friend, the same friend that's in Hawaii, um, he told me, he said, dude, you get distracted. You have a close to this guy. Is that he's given you a good objective advice. It's funny, we talked last night about uplevel. So he's like, dude, you get distracted. And you told me the same thing you told me last night about uplevel. He's like, whatever Sam Ovens has in the course, do it even if you disagree, do it. And that's what I did an accelerator and that's what I'm going to do now. Continuously. I'm just going to, I'm going to follow at work. So I'm not going to try and change it. I'm just going to do exactly what said because it's a proven concept. It's working. There's so many people having crazy results. Why would I change it so that that's all. That's it. Nick Hauser:	Nice. What was the actual step by step for you to, you know, reach out to new network marketers and be like, Hey, I see you're doing this or I think I can help you. How'd you land those first few clients? Greg Viegas:	So I did the direct outreach, right? I started the facebook conversations. Um, you know, whatever's caught, they're just using the same thing. I mean talking to strangers, creating a conversation and just finding if they have a problem. And based on that, I was able to easily, I mean it was so quick just following that program of using a simple tool like facebook messenger. Nick Hauser:	Nice. And what was your process from there? It's a message to them getting to a conversation. How would you first identify like does this person have a problem or are they even worth my time to go speak more to and get on a phone call with? Greg Viegas:	Right. So I've followed parse a start a conversation, then get them onto a to book a strategy session, get on the phone with them and of course the get them on that website. They saw my value video and once they saw that they were like sold like literally right away because you know, they, they saw that was something real. And then I started talking. See if you find a niche you see with real estate going back to real estate, there's words and things that I don't know, the vocabulary that I don't know about the industry, but with this industry, for example, network marketing, I know, you know, there's certain things I can say, which people were like, Whoa, this guy has been in this industry. Right? And that goes for any niche that's out there. Right. So I would use, you know, talk in their language and mirror and stuff like that. And at that point, you know, they're, they're literally going to say I need help. I need help with this. Nick Hauser:	Yeah. I think the niche lingo is very underestimated because it does like when a stranger reaches out the person, the first thing you do is like, who is this and least if you know, you're speaking their language. So like people like people who are similar to them. Right. And you mentioned the value video too. So you're having a facebook conversation. You do get them on the strategy call to enroll them or not. When do they get that value video? When did they see that? Is that something that you send to them or how does that work? Greg Viegas:	So with the value of video, what you do is if you notice that they are asking questions and stuff like that, you say, hey, you don't have to say value video. You say, Hey, I created a, a quick case study. Right. And when they see, you know, they hear the word case study or something like that. They're like, oh cool. So you send that to them and they watch it right away because here's the thing, when you use that lingo, would you, you know, maybe you know, a lot of people will post on Facebook, I'm doing this and this and this and then when you have a conversation, you know that's not the truth and not making that or it is a different story. Right. And then when you find that out, you can, you can actually, you can find out what the pain is, right? And at that point you can send them that value video or that, that case study. And then they go through it and they say, Hey, I'm, you know, I want to do something, I want to do something here. And at that point I would put them on a quick a strategy session call and just follow that script book. I mean they could probably hear me flipping the page of the, of the, of the, that the, the ultimate script book. But it works, it really works. Nick Hauser:	And so now, once they watch that video, are you allowing them, are you just sending the video and they're, they're coming back to you via facebook messenger and saying hey, I want this. Or are they going out to the next page, the schedule page, and then filling out a survey and then kind of booking more on demand. Greg Viegas:	So what I did with that was as soon as they see the video, I don't wait right there. There's no reason for us to move forward than to not move forward at that point. Okay. I mean, you don't want to, you want to keep sending them more information and stuff like that. It's like, look, you've already seen what we can do. We've had a conversation, you've seen a video, let's get on the phone, answer a couple of questions. I've got a couple minutes right now. I'm really busy, you know, working with other clients and stuff like that and let's see if we can find a fit for you. And then I just follow the script, what's in there? And at that point it's either like we're going to do something or not and you give them that. You just follow it, right? You give them whatever is in that course, you follow it to the word like even from a guy that um, you know, like, like Sam talks about how he's made 1600 calls and stuff like that. I mean when I was 18 we would make 100 calls a day, right? Um, and, and we would do that and there was a way that was grained in her head to do that. And when you learn this, it's a little bit different. So that's my friend was like, dude, follow exactly what he says and you know what? It works. It works. Nick Hauser:	Awesome. Now, what is it that you're actually providing to these network marketers like what is your service look like and how do you package that? Greg Viegas:	So, you know, it all depends on what they want to do, right? You can start from anywhere from $2,000 to, you know, $10,000, $15,000. It all depends on what they really want to do. So, you know, with network marketing, you can't go out there and just blast network marketing on facebook ads. Okay. The, you know, there's certain ways to do that. So what we do is we create a story for them and stuff like that. And then we teach the, well we don't teach them, we do it for them. Um, we basically created ad we create the long format for them or a short form or a video and we showed them how to use facebook in a way that it's not network marketing. And, and it's funny, it actually works even better because people are reading their story, they know, like, and trust them. Uh, after they read that story and then they actually, they don't get directed to a site because I mean that's just a site, I mean, people don't even like another one of those, they, they, you know, they follow the program that kind of like, that's in consulting accelerator the go and um, you know, they scheduled time to speak with the individual who's promoting whatever they're promoting. Nick Hauser:	Is there any specific type of network marketer or in an industry that you tend to specialize in or is it just them as a whole? Greg Viegas:	It's them as a whole, you know, and, and there's going to be people with all different types of budgets. Uh, all, you know, all different types of goals and stuff like that. Nick Hauser:	Nice. And is it a, is it 100 percent like done for you, like you're doing everything for them? Greg Viegas:	Yeah, 100 percent done for you. Um, you know, and also if they want to do coaching and stuff like that, uh, I can definitely, I definitely do that as well, you know, help them and coach them because a lot of people, they get into the same industry and they get into, they get involved with someone who just got involved. Right. Then the middle, it's like, it's like the blind leading the blind. Sometimes they have no clue where to start and what to do. Nick Hauser:	No. What are some of those things in network marketing? Mlm, like just the, what does a typical person do, like they, they, they get signed up by their friend or somebody they know and then like what happens next to them and why is it that they really aren't as successful as maybe they should be like when they work with you. Greg Viegas:	So here's what happens. So typically someone gets started, they follow their company training. There's nothing wrong with that. It's just a lot of it's really old. Um, and they get involved and they make a list of everybody they know have like a hundred or 50 people. They contact all those 50 people and they basically go and what's called the NFL. No friends left list, right? Because nobody, nobody wants to know. And then they went from excitement, you know, it's an emotional rollercoaster and then all of a sudden they're going down the rollercoaster and then maybe they get a friend that says yes. Uh, so, you know, I remember when I was in network marketing, when I, when I first got started, I paid for someone to sign up. That was my mom, right? I couldn't get someone to join. So they go through an emotional rollercoaster. Greg Viegas:	They see all these people having these crazy results. Well these people are having results because they're doing something. So that's the typical way to get started. It's super old school. They invite someone to a meeting. I mean some of the people are doing some, some facebook stuff now I'm seeing them doing like boost facebook boosts and all that, which doesn't work. So they try these different methods and then they, they Kinda, they kinda just burn out and then they say, well it's not, it's not, you know, I'm not good enough. And stuff like that. And then they kind of wonder how some people have success and some people don't want. It's because the people that do, you know, they're doing some different things which, which are, which are working really well. Nick Hauser:	And you know, what's an example too of something that network marketer offers Greg Viegas:	like in, in, in product or. Nick Hauser:	Yeah. So you know, you're helping them like land more clients or answer their, their base of um, like people under them. And so, you know, what's an example of, you know, something they would sell and like how much that would be. Greg Viegas:	So typically, you know, network marketers, they sell products all the way from health and nutrition to a service membership services and you know, that they earn it. All different companies have different compensation plans, you know, they get paid. Um, I dunno like 30 percent, 20 slash 10 slash 20 slash 30 percent of the compensation plan. They build an organization, um, some even pay up to I think 50 or 60 percent of the company will actually Max out, uh, but, but they build organizations and stuff like that. So the key thing is for them to find momentum, right? And to find leaders. Now, here's the cool stuff. People, you know, people don't understand what facebook ads. It's pretty interesting because you can find those people, right? Um, you know, you can find those people and you can find people that are, that are looking for that exact product or that exact, a niche that, that company's product may solve. And that's where facebook ads gets really cool. Nick Hauser:	Nice. Is the ads you're running for them? Like what is the, what does the funnel look like? They, they see an ad and started to them and then what happens next? Greg Viegas:	So they see an ad in, in what the ad does, it gets, it gets the prospect to like that person, right? So that's the main goal of that. And then it's up to. And then it's really interesting because we get the prospect to actually book a call with this. Uh, you know, the person that's promoting that and it's so funny, like these people will actually message a message, the person on facebook and stuff like that saying, hey, I got, you know, hey, you're one minute late for the call, where are you? Like, we're literally dialing in and they're like, where you're one minute late, where are you, you know, I'm excited for this call. So we give, you know, it's very interesting how we reversed it, where we've taken something like a network marketing where, you know, it was typically pushed through marketing, right? Where you're pushing it out in the marketplace and we've created it. We've actually put a spin on it where it's actually pulled through marketing. You're using things like that and attraction marketing to get people involved, you know, by, by simply just using the internet. Nick Hauser:	That's powerful. Yeah, definitely for that. From everything that I know about Mlm, right. I would agree with you that it's pushed, pushed, pushed you like up here it comes again. So that's where I want to transition to next to you, the stories, you mentioned that a couple of times, how is it like a story I'm more captivating to pull somebody in or is it just saying like, Hey, I have this product, do you want to buy it? Greg Viegas:	Right. So another thing I do is I do, you know, when you run these ads and we have people that respond, I like to speak to them once in a while and see what see the type of people that are coming through. So I asked them why did you click this? And typically it's like this. It's like it's not one of those things where you just see someone in it and that's it. It's like we will, we can relate to the person because you write the person's story, right? You know, where they started, the beginnings, the journey and now the end and hey we can help you do it too. Right? So when the prospect sees that they're reading a story that you eat, it's very interesting because you will see that somebody will read like a really, really long ad, like, like super long. They'll read the whole thing, they will comment on it, they will share it and that's, you know the. And again you do market research, you go back, you asked, you kind of plan to review, you can review your results and then you can just continuously go from there. So that's, that's the really cool part about that. Nick Hauser:	Once they get there to where do they go next? Is it automatically, you know, having the call to action to book a call with them. Did they go to a landing page, you know, what are those next kind of steps? Greg Viegas:	So typically with, with that, you don't wanna you don't want them to go to a landing page because facebook will actually, you know, the, there are certain things you can say and you can't say and stuff like that. With facebook you want to be very careful with talking about money and stuff like that. Especially if you're running facebook ads, right? So you want in and of course you don't want to entice people you want, you know, that's, that's just not the thing you want to do. You don't want to entice them and have a capture page with like, I've seen people's landing pages with like money flashing all over it and it's just, you, you don't want to do stuff like that. I mean, I don't even think you're allowed to write, um, social, just not something that you want to do. So you, you, you want to get on the phone with the person, you want to find out who they are, you want to start a conversation with them. Greg Viegas:	So that's what we do. We have them book a call and this is all stuff I learned in, in the accelerator program, which I would have no clue how to put this together. I mean, I literally put this together like I don't know where I was, I must have been driving or something. And I'm like, oh, that'll work. I was having a conversation with myself. I was like, I was like, dude, that'll work. Let's try it. So we tried it. Um, in Bam, I tested something I wasn't, I'm not even in, I'm not a network marketer. I mean now I just help people so I'm not, I'm not even in a company, but I'm like, let me test this, let me pretend I'm in a company. So I put my story together. Um, and I ran some ads and then Bam, they started coming in so that they go, they get a call and then based on that call, um, you know, then it's up to the person, right, what their skills are from that. And at that point now if someone comes to me and says, I don't know how to close them and that's something else I can talk to them about. But yeah, it's up to them to do whatever they want with the lead from there. Nick Hauser:	Nice. And that story to, you mentioned like the structure, obviously we can jump into a full thing, but just like a high level, you know, like before, during, after here's every can help. Let's like an example of a story that you know, for context, for others listening, Greg Viegas:	right? So example of a story is, you know, hey, if, if you know, if you have seen in my life, uh, you know, 10 years ago, um, you know, and if you see what I'm doing today and would have told me that, you know, this would've been possible, I've told you, you're absolutely crazy. You know, I was um, I was struggling financially. Um, I had no friends laughed, nobody wanted to join me, nobody had believed me, but I kept on going, invest in myself, invest in personal development and I was able to design a lifestyle, a lifestyle that, you know, people always talk about, but I kept with it. And what I'm doing today is I want to help other people create that lifestyle. So if you're one of those people that want to create that lifestyle, you know, send me a message below and let's get on the phone. Nick Hauser:	Yeah. This is a good thing because what's very interesting is you found a way through the story based for something that's kind of like a, Nick Hauser:	like business opportunity essentially when they get on with it. That's something that allowed for so many people get flagged with. I don't know if you ever see the facebook messages back like people in the group and whenever they have any kind of income claims on the landing page or in the head, it's always like, this may represent a business model, Mlm, I know the exact quote, but that we don't approve of. So it's really interesting that you are directly in the one that they're referring to a lot, but you still found a way to make these things work. Greg Viegas:	Right? And, and it's fine if you make it work. I mean, I mean, you really can't, uh, use money claims with anything, right? You can't. I mean, I remember the company which we were with a five years ago, I mean, five years ago, we would put in, in income disclaimer on emails, on the simple facebook post like you, you, like today, you have to be careful if you use it, if you use an income testimonial or something like that, uh, of, uh, you know, number one, most of them are not real, right? They're not real screenshot or they are people hit, you know, right click, inspect element and stuff like that. Um, you know, they post stuff like that. So you have to be really careful and you have to be real right here. Here's what I found. It'll come back to you as long as you're real right. Greg Viegas:	Everything will be good. I mean, if you're not, it's going to come back to you. So, um, that's, that's the cool part about it. You don't have to, you don't. Here's what I found. I've got, I've had enough facebook account maybe six, seven years ago was shut down for income, you know, doing, copying other people in complaints and I never signed anybody up even with income claims. Um, and then I stopped doing it and I started doing stuff like this and you get more people that actually get attracted to you. And that's what I find when I talk to, um, some of the people that come through these. It's like, it's, it wasn't one of those things where people are just talking about money. They're talking about their real life and what they went through. Nick Hauser:	Nice. So right now, what are you doing to land these clients? Are you still doing the organic method or is it something else? Greg Viegas:	So still using, um, a very little bit of organic, very little because now of course I'm an uplevel which is, which is a whole nother world which kind of teaches you how to use a create that on an automated system and it just kind of create a machine. So kind of slowing down with that. I only keep up, I only keep a handful of clients would that right now. And I'm not really trying to, you know, add too many with that. So, um, that's, you know, if I need it to continuously do that, I would use, I would, you know, use a messenger. I would use linkedin. Um, and, and quite frankly, if I was to start again in accelerator and, and, and I will go through the course again, right? Because there's certain things, it's like the book think and grow rich. I read it once a year, every time I pick up the book it's like somebody rewrote it. Greg Viegas:	And it's not that as I've grown as a person, so, um, you know, I will go back and go through that. But yeah, if I was going through it, I would use Linkedin, I'd use facebook. I mean it's, it's again, it's so, it's so easy to do and easy not to do. It's so easy to knock a message, you know, 20 people, right about what you're doing here at a conference, uh, but it's so easy not to and people get stuck in that thing that, um, they get stuck there because it's so darn easy to do, but they don't do it. And then they wonder why they don't have results and it goes with everything. Nick Hauser:	So you're starting to build out your, your ads and everything. Are you building out a program to another that you're an up level? Greg Viegas:	Yeah, I'm building out a program. Nick Hauser:	Like have you, have you started enrolling people in for the program too? Or how does that look right now? Greg Viegas:	So I'm at that step, that step right now, which is gonna be really exciting because, uh, I've been doing some of the cool stuff in there. Like I didn't even know I knew about Linkedin, I didn't even know that. It's something like a, I did a couple of the things the other night. It's like, it's weird because I'm up to like 2:00 AM nowadays again, because of upleveling. It's cool. Like you don't want to go to sleep because this stuff is really cool. It reminds of the Internet marketing stuff back in the day. So, uh, based on that, um, it's gonna be really cool. Like I'm, I'm, I'm looking. I mean my goal here is to get to that six figures monthly very, very quickly and, and trust me, you know, again, like my story, you're talking about the story. If you had told me back in July, you know, I'd be doing what I'm doing right now with consulting in Sam Ovens and stuff like that. I would've told you you were crazy. You crazy. What are you talking about, man? Nick Hauser:	Yeah. That's awesome. When you were getting started, I think as you mentioned to you, like if you were to go back again and you do these things, how are you structuring your day? A lot of people ask that question, well, I'm doing some done for you services, but I also want to reach out to people, when do I do my strategy calls? When do I look at my, like my books and stuff? What did that look like for you? Greg Viegas:	So being like a, like a crazy entrepreneur thing with us is we don't do a little bit and sometimes it can hurt us. We go 100 miles an hour with whatever it is. Um, and that's Kinda what it, what it was for me. Um, if I woke up at eight and, or if I woke up at whatever, I would go nonstop. I mean I would go until midnight and I'm trying to figure this out. I mean what stopped me and accelerated and I understand the process now, like it, it unlocks a week at a time. So I would have an alarm set on my phone for when the next week would unlock because I would go things fast because I want them to go through it as quickly as I could because I was like, I don't have time. So structuring the day, I do whatever it takes. Greg Viegas:	Right. You know, I would schedule the calls whenever the calls are available. It doesn't matter to me. It's like people see me working on the weekend. Right. And like, like people that are the regular world, the masses and then like what's wrong with you? I'm just like, these people are crazy weather they talk about and I learned the other day. I'm like, look, I'll work 90 hours a week. So I never had a paycheck like 40 hour, 40 hour week paycheck. So with the structure wise, with me, it's just, it's just, hey, if somebody I'm going to do as much as I can create as much momentum as they can as quickly as I can in the shortest amount of time that I've got. Nick Hauser:	Yeah, I think that's a really great point because sometimes like when you're doing organic, it's a little different when you have the ads coming in, you set your calendar. Ads Ads is like a, you have to pay for it, but it still is a luxury in a sense that you could say, hey, from 8:00 AM to 5:00 PM, here's my strategy calls, I'm going to take care of the other stuff in between, but sometimes organic, like you were saying, you're going all day, you don't know when that person's coming online next. They might like be like, I'm ready to go now and you got to transition a little. So I think it's good for people to hear you say that because some people look at it too rigid and they're like, once should this exact time sloppy blocked for me, and then they kind of freak out. They don't have enough time for calls. It's a good point. What's five years now? Like you're, you're building this program out. You can really start scaling things with the ads and apply everything you've been doing and from your prior experience at the Mlm company, what's the vision here for you moving forward? Greg Viegas:	So the vision for me here, moving forward this year, 2019, this needs to be seven figures, $1,000,000 minimum this year and it needs to, it needs to grow every single year. So my five year plan is $10,000,000 in sales by creating this program and in my mind, and I mean I wouldn't have said this last year, my mind has been expanded like you couldn't believe, accelerate expanded my mind and I thought I knew all this stuff, but that expanded, expanded my mind and then getting into up level completely expanded my mind in hearing the results of other people that have gone through these programs. Um, so here's what I learned from one of my mentors a long time ago. He said if you look at other people's results and based on their stories and their actual results, it's not a question of, of, of if it's going to work, it will work as long as you stay consistent with the program. So five year forecast, $10,000,000, um, and I'm sitting on the beaches of the world while I'm doing that. Nick Hauser:	So you are, you more interested in, in taking it as high as you can go in for right now anyway, keeping it like you, is it just you running the business and maybe a couple other people, Greg Viegas:	right? It's just me Nick Hauser:	and a couple other people, but I'll expand a little bit. I'm just a bit like maybe a handful worth, um, just to, to that point. And that's it. And then just go change the world, man. It's interesting. Everyone says that and then once they get to that point, they're like, well I've kind of been here for a while. Maybe I should do like build out a team and stuff and like get an office. We just see it happens all the time. Now that's not the case for you, but um, it will be a good thing when we get to that point. Right. What's been the most transformative part of going through this program or both of the programs so far for you? Greg Viegas:	So the most transformative part is uh, and this is really cool. It's being in those private groups, right? The private facebook groups and seeing the results that people are having. I mean, I, I've seen, you know, I see people in as entrepreneurs who um, don't make that type of money, right? And then you see someone come into accelerator and you see their story, what they're posting in the group and they're posting results that, you know, in some cases people made this money in a year and they're making it in one day. So it kind of expands my mind. Will you see all these different results that people are having. You know, that's one thing. But then you see were the results of some of the people in accelerator who are doing six figures a month and, and people that are doing like seven figures in just, it's just crazy. Greg Viegas:	So when you start hanging around with those types of people in those groups, it really starts to rub off on you and your mind. It, it just starts to expanding. Like I, I literally like, here's a, here's a crazy story. Like this is crazy. So I started, I started. One of the things I always want to do is get my private pilot's license, right? So I'm there with my instructor and this is like mind expansion stuff. So we're in ground school and worked with. We just finished a flight and he's talking about how, you know, it's expensive and stuff like that. And I was talking about, yeah, I mean one day I want to buy a plane with maybe half a million or a million dollars and they're like, what? And to me like now those type of incomes, they're, they're totally achievable if you literally break down number one, which you have to do, but number two, if you see the results that people are having, why not you? I mean, you can do it too. Nick Hauser:	Yeah, that's a great point. A lot of people mentioned that too, and it's always until they get in, until they get in the group, then they go, like you're saying that group is so damn valuable. And, but for people who were like on the fence or they're, they're considering buyer, not the hero group. And they might say like, well everyone's got a drink every course. I see like they've got their own group and your group's not going to be helpful for me. Like I want the course. It's the course. It's the course. Absolutely is. But obviously what we've seen, this is definitely a fusion of that. And so looking back on what you know now, if the groups didn't exist and you just had the course and you just had to go do it on your own, how would that have maybe changed things at all for you as far as your progress, momentum, your expansion of your mindset? Can you tell them that? Oh yeah, totally man. I Greg Viegas:	mean the group, I put notifications on it, so like both the groups I'm in now. When somebody posts, I get a notification and it's just, it's just like, it's just like, it's like a jolt of. It's like a jolt when you see someone to ring that bell and those of you that get started, you'll understand what that means. I mean that is the coolest thing in the world when you. It's like, it's like a jolt of motivation that keeps you going. It's like it's like a family. There are people that are having success and when you see the amount of success that people are having in there, do you, I mean, I don't watch TV, don't do things like that, extracurricular activities like stuff like that I'll take off for a month and travel the world, but when you see stuff like that, you're like, damn, I gotta get back to work. Greg Viegas:	Right? And was that. You're seeing all these people that are having these incredible results and when you see their story, when they're talking about, look, I had no idea what I was doing. I just followed the program. You're seeing them have results. You've had the exact same tools, right? That they have. What's the difference? Well, the difference is the you factor, right? And you start to realize that you know the you factor, you look in the mirror, right? And you start to realize that when you go through the group and you see all this success and assault like one here, one there, it's like Bam, Bam, Bam. All these people that are literally changing their life. Nick Hauser:	Yeah. Yep. That's awesome. And now to what is like the number one piece of advice you'd give to a new member or a member who is trying to make that breakthrough right now, that would really help them. Greg Viegas:	Yeah. So I bought, for me, I bought literally every course that exists. I spent tons and tons of money that I didn't have 'em on buying different courses. And when I looked at this course, you know, I looked at, I was like, yeah, I'll do it. I'll do it eventually. And I waited a month and that was probably the biggest mistake because it put me in a month like, here, here's what you got to realize. I've gone through up level right now. If I started this a month earlier, look, I'm up. I'm an entrepreneur. I think about stuff like this. I'm like, wait, if I started this thing a month earlier, I would be a month ahead right now. I might have six figures in, you know, more right now of success. So number one, if someone's looking at this right now, know that I'm someone that's got every course out there. I've been through everything and there's nothing like this. Greg Viegas:	Here's what this course is kinda like. It's Kinda like when you buy like, like, like I have an iphone, some people use other stuff, but here, here's what it's Kinda like. I was like, what does consulting accelerator like? It's like the customer experience when, when you, when you lift that phone out of that box and it just slides out, it's that customer experience, right? When you go in there. I mean it's flawless. Everything was there. They've got all these, these, these different pinups and worksheets and upload your, your, your stuff there. So that's the first thing. If you're on the fence right now, I'm just getting right. Just make a decision and get in. It'll, it'll change your life if you follow it right? You have to put the work in, you have to follow it. This is coming from someone that's looked at everything. Greg Viegas:	I bought everything from day trading, which, which gave me a lot of stress to everything that exists out there from econ to everything. And then for the person that's in here right now, if you're not having success, looked back at it and continuously go through and look at other people's stories, right? Learn the material. Everything is there. All you have to do, right? If, if you know, if you want to work on sales, you don't read that, read that script book right three, four times until you get it. Um, you know, start the process again. Go through it. You don't just go through it. Once I once heard a mentor tell me that I think we own, I don't know the numbers exactly, but when you only retain like five or six percent of what we actually read or hear. So when you go back through it, you'll actually get it again. So if someone's been here and they haven't done anything, that idol look, it just takes one switch like this. That's all you have to do and you can get back in and you can create massive results. Nick Hauser:	That's great advice. The close it out here too. It's been great speaking with you and understanding what it actually took on your end to make this such a large transformation and then just how you think about everything. How are you. You seem to have a really great attention to detail and just you keep going. Like you said, you read thinking grow rich every single year. Most people would read that once and be like this, you know, whatever. This thing didn't help me make money and the same way you're saying go through the material again, like keep practicing. Where can people find more about you online if they want, you know, if I'm a network marketer and I'm saying whatever this guys said today about how somebody starts and where their struggles are, that's me right now. I want more information. Greg Viegas:	Yeah. They could just find me on facebook. I'm always, always there and then, you know, we have a conversation. Nick Hauser:	Nice. And just, um, you know, we know about. We say Greg Vegas is your name. How do you spell your last name on facebook? Greg Viegas:	So it last name is v for Vegas. I e g a s Nick Hauser:	awesome. Greg. Again, it's been a pleasure and I look forward to your continued success here. I'm moving forward as you grow with uplevel. Greg Viegas:	Thanks. Appreciate it. And, uh, look forward to meeting all of you guys soon. Nick Hauser:	Awesome. See you.